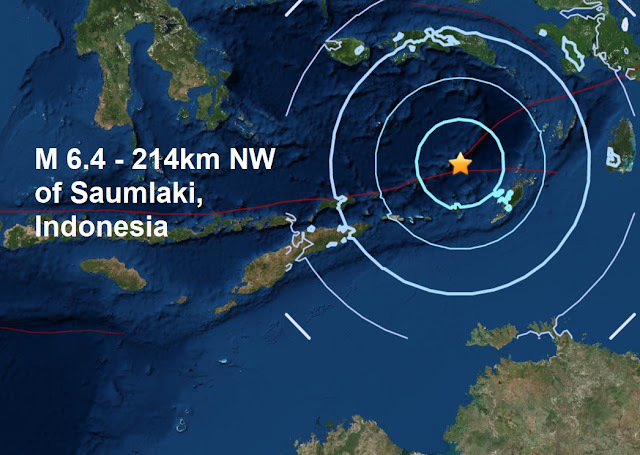 A mag 6.4 - 214km NW of Saumlaki, Indonesia is the 3rd major quake in the last 24 hours. Yesterday two magnitude 6.3 quakes were reported by USGS during the night, the Southeast Indian Ridge under Australia and Papua New Guinea being the recipients. Ten of the 29 major quakes this year have occurred in or around Papua New Guinea. Last nights major quake was the 6th of March and the 29th of 2018, 12 more than the same time period of last year. Of the 28 major quakes reported this year, 28 of them have occurred during coronal activity on the sun.